Swansea City revived their Premier League survival hopes as they beat Stoke to end a six-match winless run. The Liberty Stadium erupted as Fernando Llorente's early header gave the hosts a precious lead. The match hinged on a remarkable minute of second-half action, as Stoke's Marko Arnautovic blasted a penalty high over the bar moments before Tom Carroll's deflected long-range strike doubled Swansea's lead. That sparked further joyous celebrations, although they were tempered by relegation rivals Hull's win over Watford, which kept the Swans in the Premier League's bottom three. Swansea remain 18th in the table, two points adrift of Hull and safety, but a first victory since March will give them a much-needed lift with four games to go. Paul Clement had described this match as "must win", adding that this was the club's most important fixture since the Championship play-off final they won in 2011. An alarming decline had seen Swansea lose five of their past six Premier League matches, having won five of their first eight following Clement's appointment in January. His players appeared to respond to the severity of the situation, feeding off a fervently atmospheric Liberty Stadium as they harassed Stoke in a frenetic start to the game. Llorente fanned the flames of optimism with his goal, drifting away from some uncharacteristically slack marking by Ryan Shawcross to nod in virtually unopposed. But although they enjoyed more possession, Swansea struggled to create further chances as the game became a little disjointed. Clement seemed intent on holding on to the slender lead as he replaced striker Llorente with centre-back Mike van der Hoorn, and there was a moment when it seemed the Swans might regret removing their top scorer. Arnautovic, albeit in an offside position, was allowed to square the ball to Xherdan Shaqiri, who was tripped by Federico Fernandez, prompting referee Michael Oliver to point to the spot. But Arnautovic skied his penalty and, seconds later, it proved to be a costly miss as Carroll's powerful 25-yard effort deflected off former Swansea midfielder Joe Allen and over Jack Butland into the Stoke goal. Sitting 11th in the table and comfortably clear of any relegation threat, Stoke might have appeared to be the archetypal team with nothing to play for. However, they had disproven that theory in their previous outing, ending a four-game losing streak with a 3-1 victory over Hull, Swansea's chief rivals in their bid for survival. Mark Hughes' side initially seemed rattled by their opponents' high-octane opening at the Liberty, but they eventually composed themselves and created some good scoring opportunities. Saido Berahino squandered two of them, heading wide and straight at Lukasz Fabianski from promising positions. Following the 60 seconds in which Arnautovic missed his penalty and Carroll scored Swansea's second, Stoke seemed to lose heart, succumbing to an eighth defeat from their last 10 fixtures on the road. Swansea manager Paul Clement: "I thought it was a must-win game and Hull have won and it was absolutely right. "Nothing changed between us and Hull but what has changed is we have got momentum now. We played terrific. We rode our luck but overall deserved to win and can look forward." Stoke manager Mark Hughes: "We made it difficult for ourselves. If you are away you have got to make sure you are in the game and don't concede early and that is what we did. "We hadn't got going. At 1-0 for the most part we were OK but clearly the game has changed on missing the penalty - if we could get back on terms, who knows? "We need to be better at managing the game and affecting the opposition." 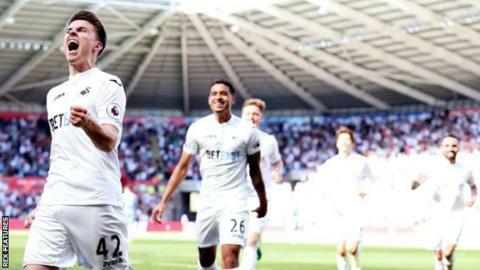 The Swans have won four of their past six home Premier League games, having won just two of their first 11 at the Liberty Stadium this season. No player has scored more headed goals than Fernando Llorente in the Premier League this season (six - level with Romelu Lukaku and Michail Antonio). Only Kevin de Bruyne (13) has more Premier League assists than Gyfli Sigurdsson this season (12 - level with Christian Eriksen), while the Iceland international has provided more from set plays than any other player in the competition (seven). Stoke have failed to score in six successive away league games for the first time since August 1997 (a run of nine). Tom Carroll's goal was his first in the Premier League since Boxing Day 2015, when he scored for Spurs in a 3-0 win against Norwich. Paul Clement has the best win percentage of any Swansea manager in the Premier League (40% - six wins from 15 games). Stoke host West Ham on Saturday 29 April (15:00 BST kick-off) while Swansea travel to Old Trafford to play Manchester United on Sunday 30 April (12:00 BST kick-off).